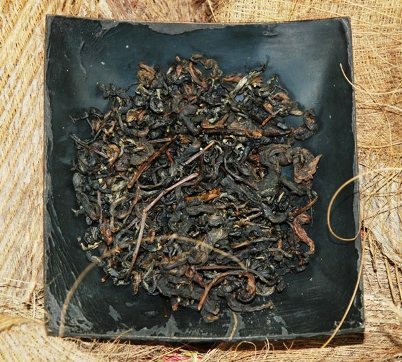 “Coconut Black” Tea Blend, blended from a semi-wild ancient tree black tea in Fang province, north Thailand, and coconut as a flavoring agent, though seemingly the least sophisticated in our line of Thai-themed tea blends, is indeed the most harmonious marriage between a tea and aroma donor that one can possibly imagine. The sweet and characteristic taste of coconut blends just perfectly with the deep and broad body of the black tea. For more information and illustrations please refer to the product description below. Coconut Black Tea Blend, a Thai black tea with nothing but… coconut. In 2014, master tea blender Kenneth Rimdahl, an expert in the Hamburg school of tea blending and flavoring with 20 years of experience in his trade, has come to Chiang Mai to establish Monsoon Teas and bring new blessings to the teas of north Thailand with his art by developing a themed Thai tea blend line on the basis of north Thailand’s fine teas. SiamTeas has started a cooperation with Kenneth and Monsoon Teas to create a dedicated line of flavored Thai tea blends, combining selected green, Oolong and black teas from north Thailand with local fruit, flowers and spices and other natural aroma agents (essential oils) to reflect not only the character of Thai teas, but also the Thai culture and feel as a whole as well as particular theme aspects thereof. The resulting choice of eight flavored Siam/Monsoon Thai Tea Blends, which we proudly offer in Siam Tea Shop is a list of true masterpieces of artisan tea blending, each of them conquering the heart of any tea lover or gourmet at first try, whether enjoyed hot or as a delicious and refreshing ice tea beverage. The “Coconut Black” tea blend is a blend of black tea from semi-wild ancient tea trees in Fang province, north Thailand and the flavor of the coconut*, one of the most typical and common Thai fruit and the inspiration for this exquisite Thai Tea Blend. At a first and more superficial glance the most simple one of our line Thai-themed tea blends, Coconut Black tea in fact represents the most harmonious marriage between a pure tea and an aroma donor that one can possibly imagine. Every sip of this masterly crafted delicious tea blend brings you right back to your last Thailand or other tropical destination holiday and to the warm and soothing climate at Thailand’s sunny beached seamed by coconut palm trees or the coconut plantations in the north of the country, where the black tea for this tea blend is collected and processed by members of the local Lahu hill tribe and where this tea blend has been conceived and created. The resulting aromatic Thai Coconut black tea blend is a delicious tea beverage to be enjoyed either hot or as ice tea, in which the characteristic sweet taste of the coconut perfectly combines with the deep and broad taste body of the northern Thai black tea to create something wholly new and wonderful. 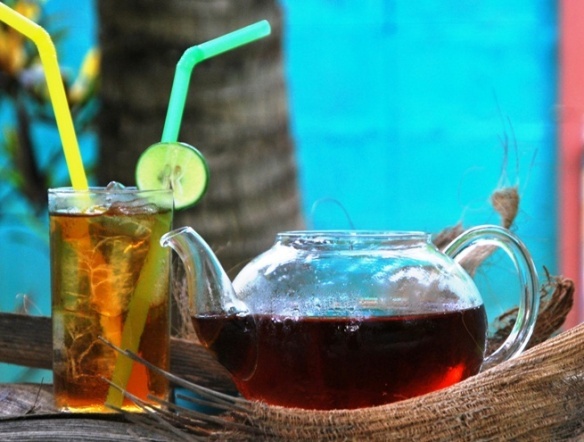 If so far you thought you didn’t like flavored teas before, this – whether enjoyed hot or as iced tea – could just as well serve to shift your perspective by some significant degree. 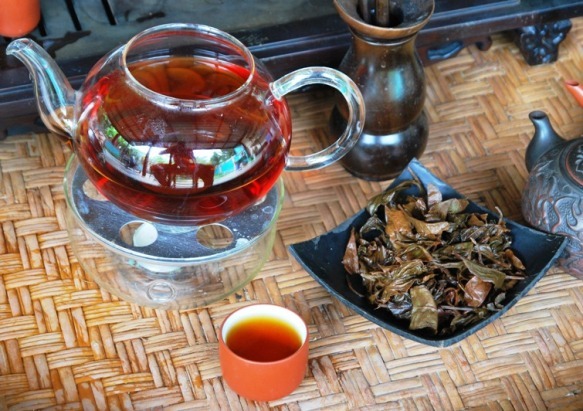 Pour 1 l boiling hot water (90°C-100°C) over 10 grams of Coconut Black Tea Blend dry tea leaves, best in a glass tea pot, and leave for 3-5 minutes. Then sieve and enjoy right away as a stimulating and uplifting aromatic hot tea or let cool down and/or add some ice cubes to receive a refreshing and invigorating ice tea beverage. 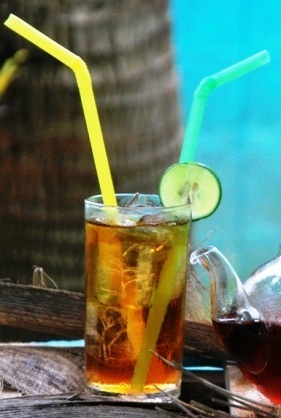 When enjoyed as an ice tea, we recommend adding a slice of lemon to visually round off this tea blend and the additon of some honey or rock sugar for even greater perfection of taste, while just a little honey or rock candy will do as a final flavor refinement with your Coconut Blend enjoyed as a hot tea. Once steeped (Western style) this is golden in colour with a soft coconut scent. Some sweetness to it but on the whole it’s subtle. In terms of flavour this does actually match the scent somewhat. A sip produces a soft and subtly sweet coconut essence with a hint of milk and some dryness in the after taste. As it cools the black tea thickens to unleash subtle sour wood notes. As thick as the black tea base is beginning to be; it is no where near strong enough to remove the coconut essence and if anything the contrast makes it all the more pleasant.